As a union member, you will have access to valuable benefits and have a voice in your professional life that non-members don’t have. First: You must sign up as a user on the UFT website. Then: Click the button below to enroll in the union. 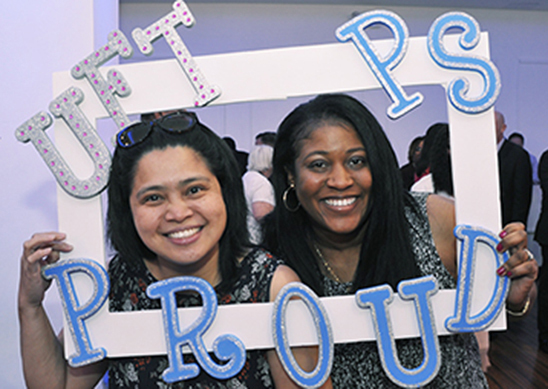 You can enroll in the UFT if you are a New York City Department of Education pedagogue, paraprofessional, hourly group or retiree. All other professionals covered by a UFT collective-bargaining agreement should contact the UFT Membership Department at 212-598-6855 for further information on how to enroll in the union. As a member, you have the right to play an important role in our union and its actions and policies. You will be able to vote in union elections and help choose the UFT's leadership team in your school and citywide. You can even run for union office. Only members can participate in the union's bargaining committee and take part in the contract ratification vote. And only members can vote in their school’s collaborative efforts to modify contractual articles in the form of School-Based Options (SBOs). As a full-fledged union member, you can participate in money-saving group insurance plans and low-cost legal and financial service plans, and you can get special member-only discounts on travel, school supplies and more through the UFT, our state affiliate NYSUT and our national union AFT. Only members have access to certain free legal services, free counseling, free or discounted training or professional development and an attorney during 3020-a employee discipline procedures. We hope you will take this opportunity to become a UFT member. If you prefer to enroll by mail, please print, fill out and mail in one of our membership forms for paraprofessionals or for other DOE members including teachers.